Honda has announces that the much talked-about Gold Wing F6B ‘Bagger’ is now coming to the UK. Originally not taken as a UK model, this decision has been reversed due to projected customer demand. The Gold Wing F6B is a new breed of Gold Wing that sits alongside the original. Stripped, stylish and smooth, part custom, part cruiser the Gold Wing F6B is all 'Bagger': a touring bike distilled to its very essence. It flows fluidly from front to rear with striking design features throughout. The twin-spar aluminium frame provides strength and delivers a great handling motorcycle, as do 45mm anti-dive telescopic forks and Pro-Link rear suspension. Built to be at home in an urban environment as well as on the open road, the Gold Wing F6B is lighter – 28kgs less than the Gold Wing GL1800 – yet with the same chassis, power and incredible torque output. 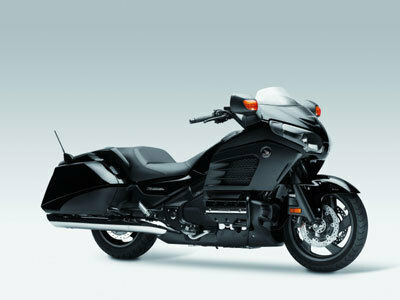 It is features such as these that have captured the imagination of UK bikers and that has lead growing pressure from prospective customers for the Gold Wing F6B to be available as a UK model. There will however be only a limited number of Gold Wing F6B models brought in to the UK and these will be available only by advanced customer order and only from selected dealers. Interested parties should contact their local dealer for further information. The F6B is due on sale in the UK in July 2013 and will be priced at £19,199 OTR.